This is one of the more classic nailing routes in the valley, yet because of the long approach the route sees very little traffic. The climb follows a variety of well-defined, classic features linked by very few rivets. 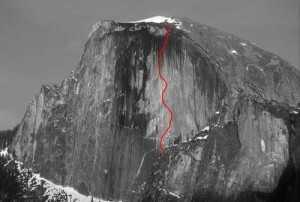 Doing a route in the middle of Half Dome's face is a much different experience than doing the Regular Route. There are no people; the wall is steep and the experience is more serene. The climbing is hard and sustained but not dangerous; it is about the same difficulty as Zenyatta Mondatta. Which SuperTopo guidebooks include a topo for Zenith? The first part of the route is hidden. Blondike is the red line and Two Hoofers is the Blue Line.